Mr. Jensen Uyeda, an Agriculture Extension Agent specializing in Edible Crops at the University of Hawaii at Manoa College of Tropical Agriculture & Human Resources led a series of workshops in mid-June at the Agriculture, Community and Natural Resources (ACNR) division of the American Samoa Community College (ASCC). 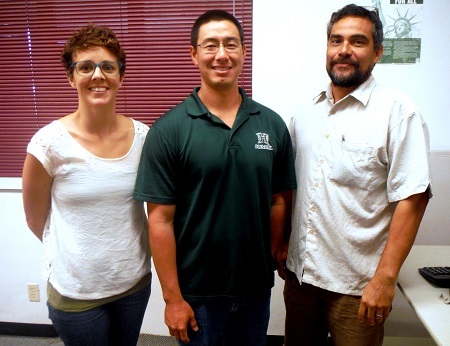 ASCC-ACNR invited Uyeda to American Samoa to conduct a Western Sustainable Agriculture Research and Education (WSARE) Professional Development Program Workshop. Funded by WSARE, the workshop attracted an audience of agricultural professionals, nonprofit organizations involved in agriculture, and farmers. “Samoa is in the same boat as Hawaii in that we are both isolated and have very limited natural resources, which makes food production very challenging to do locally,” observed Uyeda, of the “agroprofessional” trainings he conducted. “This is mostly due to the need to import everything from fertilizer to animal feed and seeds.” Over the course of two days, Uyeda shared his knowledge on topics including Irrigation Management; Hydroponic Farming Systems; Integrated Pest Management; Good Agricultural Practices & the Food Safety Modernization Act; and Crop Selection/ Conducting Variety Trials. Before returning to Hawaii, Uyeda expressed interest in working again with local agriculture professionals. “I hope that Hawaii and American Samoa can continue to collaborate on projects and educational events in the future to further advance both of our agricultural industries,” he said. For more information on ASCC-ACNR services to local farmers, contact Dr. Ian Gurr at 699-1575.